E-Z’s walk-in shelves and other system components work together to form the most versatile cantilever storage option on the market. Our heavy-duty uprights withstand full loading when mounted on aluminum skins as light as 26 gauge, no blocking required. Our shelving brackets fit into the continuous slots of the uprights, adjusting to the precise height required for your application. Scroll down to learn more about each component. Click on the sliders to see our component styles. Wall-mounted and freestanding versions available. Wall-mounted versions require NO floor supports. Attachment methods vary based on desired style. Upright section in NSF Gray. Open front for easy cleaning. Top view shows continuous channel. Often selected for beer caves. For center-room storage and presentation. Brackets and shelves affix to both sides. 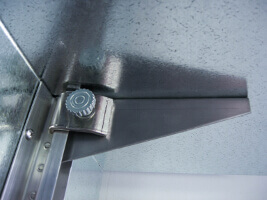 Attach to walk-in cooler/freezer ceilings and shelving uprights to provide extra stability (hardware included). Attach to shelving uprights with included hardware. 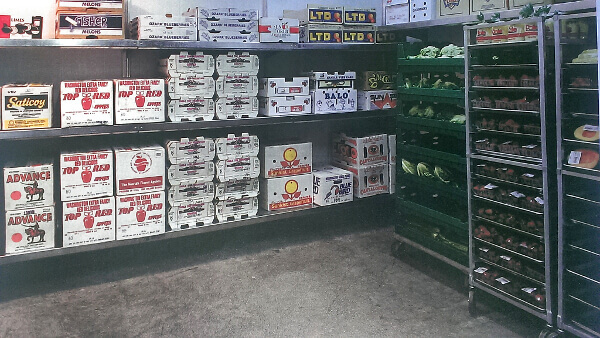 Bracket styles vary based on desired loading and shelf type. “Single” brackets for shelf ends (single top flange). “Double” brackets for interior shelf junctions (double top flange). "Single" bracket for use with end shelves. Aluminum NSF Knob Bracket for Wire Shelves. "Double" bracket for interior shelves shown. 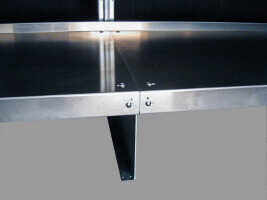 Attach to shelving uprights near floor to bolster shelves against dynamic forces (employee stepping, falling loads). Attach to standard shelving brackets with included hardware (solid and louvered) or place over knob brackets (wire). Shelf in NSF Gray Powder Coat. For use with knob brackets. Any length practical. Lengths will vary based on cooler dimensions and loading requirements.